For more than 30 years, CHUMPOWER has been the leading manufacturer of PET stretch blow molding machines in Taiwan. Every year, CHUMPOWER invests considerable effort in research and development of new technologies to meet the demands of the rapid development of the packaging market. A brand new series of PET stretch blow molding machines has been developed. CHUMPOWER intelligent L2G blow molding machine is one of its most important achievements and made a stunning debut at China Plas. In leading the industry trend, CHUMPOWER fully demonstrated its R&D and manufacturing capabilities. The intelligent L2G blow molding machine features a fully electric structure for producing environmentally friendly single-use compressible bottles. Managing Director Hsieh believes that though traditional bottled water packaging can be reused, there is a relatively large risk due to the potential impact on the recycling process from unknown contamination. The ultra-lightweight PET packaging for bottled water produced by the intelligent L2G stretch blow molding machine would self-compress due to low vacuum pressure as the water is being consumed. When the water bottle is completely empty, the bottle would automatically compress and flatten the bottle. After consuming the bottled water, the bottle can be recycling, which is safe and convenient. 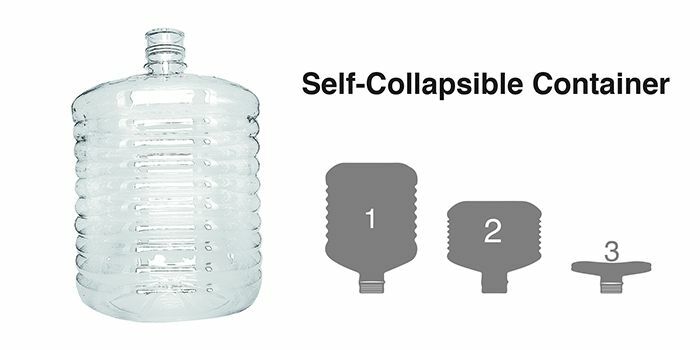 This kind of single-use collapsible compression bottled water uses ultra-lightweight PET material to produce environmental friendly packaging. The creases of the folding barrel body are created from engineering mechanics design. During the course of drinking water from the bottle, air in the barrel is separated to prevent contamination by secondary pollution from dustand so each drop of water is fresh and pure, which ultimately extends the shelf life of drinking water. It is understood that compared to ordinary blow molding machines, the intelligent L2G blow molding machine can increase the unit time capacity by 30-35%. Two cavities can be produced from one unit, producing a maximum capacity of 20L and 900-1200 BPH. Save 5-10% on power consumption and 20-25% on air consumption. The fully electric structure ensures that the machine could be operated at high speed with precision positioning. The small footprint and modular design enables easier maintenance, and features a man-machine interface control for simple operation. At the exhibition site, CHUMPOWER machines attract a large number of visitors stopping to visit, which creates an atmosphere of excitement. Many visitors are impressed by CHUMPOWER machines and the Company has received high level recognition for the stability of the compressed bottle. CHUMPOWER customers in China, Yemen and Syria have also given high praise for the PET stretch blow molding machine. Managing Director Hsieh states that CHUMPOWER aims to meet the demands from rapid changes in the global industrial by mastering the intellectual energy in the core technology, which shall a key factor affecting the development of the enterprise. CHUMPOWER will accelerate its own technological upgrades to provide customers around the world with high-value products and services. Relying on the continuous innovation of technology, we would seek new growth points to successfully anticipate and meet market challenges.